Aside from it's breathtakingly beauty, you may be asking yourself, "What are the real advantages of investing in granite countertops?" Below you will learn more about granite, including its origin and value. If you are have any questions or would like to schedule a free consultation, please contact Stone Cutters at 214-502-8029. For your convenience, you may also request services from this site. Kitchen granite countertops are created by nature and fashioned by man to be beautiful, durable and cost effective choice for kitchens and baths. 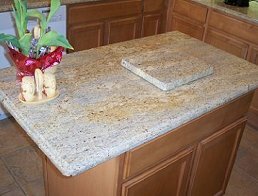 The term granite comes from the Latin root word granum, which means "grain." Granite is often imported from Europe, Africa, Brazil and other regions of the world rich in natural stone. Granite is an attractive natural stone that will add color and warmth to your kitchen and the rest of your home. Granite is also an extremely hard material that will not blister, scratch or crack. In addition, the hardness of granite is rivaled only be the hardness of diamonds. In fact diamonds are used to cut and polish granite. Over the last 10 years, kitchen granite countertops have become popular with homeowners, after first being popular with designers for decades. Granite is available in hundreds of colors, from various shades of white to browns, reds, greens, blues, and black. The most popular tones are brown and beige. As well as being hard kitchen granite countertops can take hot items, like pots and pans. Granite countertops are also extremely, stain resistant to hot grease and oil if it is sealed with a silicone-based impregnator. Granite countertops can also be easily cleaned and cut for a sink. Granite has a cool polished surface that makes it an excellent surface for rolling out pastry dough and a polished finish of granite will not wear off. Kitchen granite countertops are unique because no two pieces of granite are exactly the same. Therefore granite provides an interesting design element and adds certain richness and texture to your kitchen not found in other surfaces. Kitchen granite countertops can create a brilliance and elegance that is only found in nature. Granite adds a personality and character to kitchen countertops that is unsurpassed. 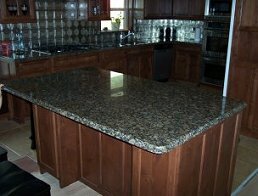 Kitchen granite countertops have a natural beauty that is capable of complementing any tone of wood or style of cabinets. It doesn't matter if you are planning a new home or remodeling an existing kitchen, with granite kitchen countertops you can be sure that you will add to value and character to your home. Kitchen remodelers and home builders have experienced a boom in the demand for kitchen granite countertops. Although it can be more expensive to put in granite countertops, they remain the odds on favorite choice for more upscale homes, since they keep their value better than most home improvements. The investment you make in kitchen granite countertops should pay you back at least three times what you invested. If you are selling your home you will find that home buyers wanting kitchen granite countertops will be willing to pay more for your home than if you have ceramic tile or plastic laminate. Planning out your kitchen granite countertop first involves selecting the right granite color. You should also concentrate on the most popular colors. Even though granite tones are usually neutral, you may find that a certain color goes well for your kitchen design. If you are replacing the old countertop material in your kitchen with granite, carefully diagram all the measurements with your granite installer at Stone Cutters. 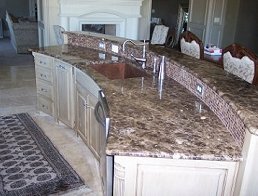 If installing new cabinets is part of your kitchen remodeling Stone Cutters are the experts in custom granite fabrication. Since you are using such a superior product as granite, you should think about the right type of sink to go with your new kitchen granite countertop. You should definitely consider going with an under-mount stainless steel sink, as opposed to an over-mount sink that would be difficult to clean around. Your designer at Stone Cutters will be happy to show all of your sink options available. In addition to getting the right kind of sink installed, it is also important to select just the right faucet to go with the sink. Be sure not forget to speak with your designer at Stone Cutters about our beautiful faucets we have in stock. The next important area is upgrading your cabinet hardware. The handles and knobs should also be of high quality in order to provide good accent to the overall look of the kitchen. Even if you are not replacing the cabinetry having high quality hardware with make those cabinets and the whole kitchen the highlight of your home. So in planning your kitchen remodeling, just remember that kitchen granite countertops will make a world-class addition and increase the re-sale value of your home. 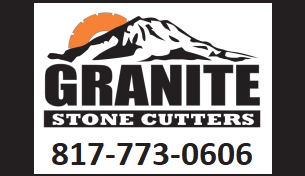 If you have any questions or would like to schedule a free consultation with one of our designers, please do not hesitate to contact Stone Cutters at 214-502-8029. For your convenience, you may request services from this site.